Bradley Rust Gray’s latest collaboration with wife So Yong Kim is an intimate and quirky, albeit incredibly lightweight, portrayal of a developing relationship that lends credence to the adage that sometimes what’s left unsaid is more important than what actually is. Ivy (Zoe Kazan) returns home to New York for spring holidays but soon finds herself playing host to old friend Al (Mark Rendall), whose parents have thoughtfully rented out his room. It’s obvious from the outset that there’s an underlying attraction — even magnetism — between Ivy and Al, despite Ivy pining over her absent boyfriend Greg. Ivy is wistful, flighty and pensive, spending time on her own at parties while Al smokes dope and flirts with various girls; and it’s deliberately left unclear whether it’s Al’s behavior or being away from Greg that is defining her mood. With Greg fobbing off Ivy’s calls, she finds herself spending more time with Al, sightseeing, relaxing in the park, watching pigeons from a rooftop at sunset. As they bond, it seems as if they’re unaware of or even unwilling to admit to themselves (and to each other) their true feelings. There’s certainly an underlying tension, and Gray’s incredibly rich direction lends these moments an abundance of warmth. In addition, Kazan’s insular depiction of the solemn Ivy is extremely emotive — absorbing even. She lends Ivy an incredible vulnerability, which only adds to her already amiable personality. Rendall’s Al is equally likable; he’s thoughtful and caring almost to the point of naivety. 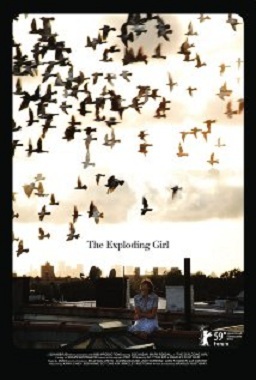 In fact, tonally “The Exploding Girl” is enveloped in an innocence rarely seen in modern cinema. It’s a sweet tale of the start of a love affair that is beautifully shot and well acted, but it’s also somewhat marred by being sparse, slight and fluffy.